I am fundraising to help 30 blind girls to go on an adventure trip of a lifetime!! Each year the NAB Centre receives numerous applications of blind girls who have completed their class 12th exams and now want to join the colleges in Delhi. If selected, the girls are at the Centre for the next 3 months to undergo gruelling training sessions in Computers, English communication, Personality development and grooming, mobility (how to travel alone using a white cane), theatre, self defence, cooking, housekeeping, shopping and career counselling. In the midst of all of these trainings, they are taken out for an all out adventure trip to hill stations. This 3-5 day camp helps them to face their fears head on and overcome them, and in the process making them explore a stronger and resilient side of their personality! It is indeed a life changing experience for each one of the girls and the Centre raises funds for the trip every year to keep it going!! We have been able to raise Rs. 75,000 against a total requirment of Rs. 2,05,000. The staff at NAB Centre thank you for supporting this campaign. 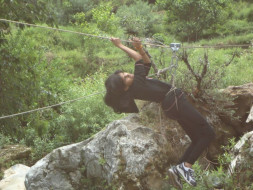 30 blind girls from the centre in Delhi travelled to Nainital and participated in adventure activities at an adventure camp specially set up for them. They rappelled across a river, participated in rock climbing and trekked on surrounding hills. NAB plans to regularly take these girls on adventure trips to nearby locations from Delhi.